Dr. Howell and Rev. Parker Haynes are leading a pilgrimage to the Holy Land. Here, Parker shares updates from the trip. After several delays and a long plane ride, we have arrived in Israel. Day One begins in Caesarea Maritima, where Herod the Great built an opulent palace, Peter visited Cornelius in Acts 10, and Paul was placed on trial. Then on to Sepphoris, Nazareth, where Jesus grew up, and finally Cana where Jesus partied at a wedding. Amazing! 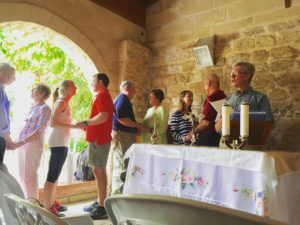 Photo Caption: Dr. Howell led a renewal of wedding vows in Cana, where Jesus attended a wedding and worked his first miracle.